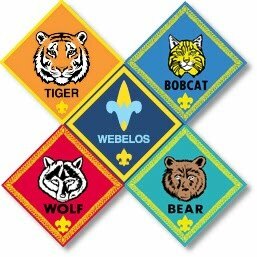 As with all Cub Scout ranks, new Scouts must first earn the Bobcat Badge to be eligible to work toward the Webelos badge. Scouts will need a Webelos Handbook, which is available for purchase from the Scout Shop or online at www.scoutstuff.org. PLEASE NOTE! Beginning with the 2015-2016 program year, changes to the Cub Scout program and materials mean that there's a new handbook that contains the updated curriculum. Make sure your scout has the new book! Complete two Webelos elective adventures of your den or family’s choosing. These are the core required adventures for the Webelos Badge. At an approved time in an outdoor location and using tinder, kindling, and fuel wood, demonstrate how to build a fire; light the fire, unless prohibited by local fire restrictions. After allowing the flames to burn safely, safely extinguish the flames with minimal impact to the fire site. Set personal nutritional goals. Keep a food journal for one week; review your journal to determine if the goals were met. Plan a menu for a balanced meal for your den or family. Determine the budget for the meal. Shop for the items on your menu while staying within your budget. Demonstrate an understanding of food safety practices while preparing the meal. Earn the religious emblem of your faith for Webelos Scouts. a. Help plan, support, or actively participate in a service of worship or reflection. Show reverence during the service. b. Review with your family or den members what you have learned about your Duty to God. c. Discuss with your family, family’s faith leader, or other trusted adult how planning and participating in a service of worship or reflection helps you live your duty to God. d. List one thing that will bring you closer to doing your duty to God, and practice it for one month. Write down what you will do each day to remind you. Visit with a first responder. With adult guidance, lead younger Scouts in a fitness game or games as a gathering activity for a pack or den meeting. Assemble a hiking first-aid kit. Describe and identify from photos any poisonous plants and dangerous animals and insects you might encounter on your hike. Before your hike, plan and prepare a nutritious lunch. Enjoy it on your hike, and clean up afterward. With your Webelos den or with a family member, hike 3 miles (in the country if possible). Complete a service project on or near the hike location. Perform one of the following leadership roles during your hike: trail leader, first-aid leader, lunch leader, or service project leader. These are the elective adventures for the Webelos Badge and the Arrow of Light award. a. Carry out the experiment you designed for requirement 1, above. Report what you learned about the effect of fertilizer on the plants that you grew. b. Carry out the experiment you designed for requirement 1, but change the independent variable. Report what you learned about the effect of changing the variable on the plants that you grew. c. Build a model solar system. Chart the distances between the planets so that the model is to scale. Use what you learn from this requirement to explain the value of making a model in science. f. Study the night sky. Sketch the appearance of the North Star (Polaris) and the Big Dipper (part of the Ursa Major constellation) over at least six hours. Describe what you observed, and explain the meaning of your observations. i. Read a biography of a scientist. Tell your den leader or the other members of your den what the scientist was famous for and why his or her work is important. Demonstrate the precautions you must take before attempting to dive head first into the water, and attempt a front surface dive. d. Create a freestanding sculpture or mobile using wood, metal, papier-mâché, or found or recycled objects. g. Create an original logo or design. Transfer the design onto a T-shirt, hat, or other object. i. Create a comic strip with original characters. Include at least four panels to tell a story centered on one of the points of the Scout Law. Characters can be hand-drawn or computer-generated. a. Create a hard-copy or digital portfolio of your projects. Share it with your family and members of your den or pack. b. Invite an individual with a disability to visit your den, and discuss what activities he or she currently finds challenging or found challenging in the past. d. Talk to someone who works with people who have disabilities. Ask that person what they do and how he or she helps people with disabilities. a. With the help of an adult, demonstrate one way to light a fire without using matches. b. On a campout with your den or family, cook two different recipes that do not require pots and pans. a. Learn what items should be in an outdoor survival kit that you can carry in a small bag or box that easily fits in a day pack. Assemble your own small survival kit, and explain to your den leader why the items you chose are important for survival. b. Show you can live “off the grid” by minimizing your use of electricity for one week. Keep a log of what you did. Discuss with your den members how you adjusted to this lifestyle. c. With your den, invent a game that can be played without using electricity and using minimal equipment or simple items. d. Name your game, write down the rules once you have decided on them, then play the game at two different den meetings or outings. e. Teach your game to the members of your pack or other Scouts. f. With your den, demonstrate two different ways to treat drinking water to remove impurities. g. Discuss what to do if you become lost in the woods. Tell what the letters “S-T-O-P” stand for. Tell what the universal emergency signal is. Describe three ways to signal for help. Demonstrate one of them. Describe what you can do you do to help rescuers find you. h. Make a list of four qualities you think a leader should have in an emergency and why they are important to have. Pick two of them, and act them out for your den. Describe how each relates to a point of the Scout Law. Describe how working on this adventure gave you a better understanding of the Boy Scout motto. c. Share with your family or with your den what you learned about the meaning of geology. a. Identify the rocks you see on your rock hunt. Use the chart in your handbook that shows the three kinds of rocks and describes minerals to determine which types of rocks you have collected. a. With your family or den, make a mineral test kit, and test rocks according to the Mohs scale of mineral hardness. c. Record the items you find. a. Go on an outing with your family or den to one of the nearby locations you discovered on your state map, and record what you see as you look at the geographical surroundings. Share with your family or den while on this outing what you notice that might change this location in the future (wind, water, ice, drought, erosion). i. With your family or your den, visit with a geologist or earth scientist and discover the many career fields that are included in the science of geology. ii. Ask the geologist or earth scientist about the importance of fossils that are found. iii. Ask the geologist or earth scientist what you can do to help preserve our natural resources. a. Examine a set of blueprints. Using these as a model, construct your own set of blueprints or plans to design a project. b. Using the blueprints or plans from your own design, construct your project. Your project may be something useful or something fun. c. Share your project with your Webelos den and your pack by displaying the project at a pack meeting. b. Determine what sort of heat is used to heat your home. c. Some, but not all, of your lights go out. a. Show how to change a light bulb in a lamp or fixture. Determine the type of bulb you are replacing. Learn how to properly dispose of a compact fluorescent bulb. s. Find wall studs, and help an adult hang a curtain rod or a picture. t. Take an old item, such as a small piece of furniture, a broken toy, or a picture frame, and rebuild and/or refinish it. Show your work to an adult or your Webelos leader. u. Do a Fix It project agreed upon with your parent. Learn about aquatic ecosystems and wetlands in your area. Talk with your Webelos den leader or family about the important role aquatic ecosystems and wetlands play in supporting lifecycles of wildlife and humans, and list three ways you can help. Identify three different groups of trees and the parts of a tree. a. Teach your den the words and melody of a song. Perform the song with your den at your den or pack meeting. b. Create original words for a song. Perform it at your den or pack meeting. c. Collaborate with your den to compose a den theme song. Perform it at your pack meeting. d. Write a song with words and music that expresses your feelings about an issue, a person, something you are learning, a point of the Scout Law, etc. Perform it at your den or pack meeting, alone or with a group. e. Perform a musical number by yourself or with your Webelos den in front of an audience. a. Create a grocery shopping list for the week. b. Complete the laundry for your family one time. c. Help prepare meals for your family for one day.